JAKARTA, INDONESIA, Apr 25, 2013 - (ACN Newswire) - Indonesia has unlimited investment opportunities as a developing country. Christovita Wiloto, PowerPR CEO Asia Pacific, said, "The government, businesses, and investors should optimally utilize the vast investment opportunities in Indonesia. Foreign investment oppurtinities in Indonesia this year are supported by economic growth in 2012 still above 6%. Besides that, domestic consumption and the number of people in Indonesia can be drivers for investors to choose Indonesia, although there are many policies that need to be improved especially in terms of licensing." Principally, Indonesia has to be innovative in investment sectors and no longer rely on cheap labor and focused on natural resources. Primus Dorimulu, Investor Daily Chief Editor, said, "The example of investment products that are supposed to increase the added value of the investment, from coal to power sector, from investment in the textile industry to the apparel industry by making clothes with better design and certainly, all the investment sectors rely more on the carrying capacity of the technology." Christov further explained that Indonesia's economic optimism is still the main attraction for investors compared to other Asian countries this year, due to the carrying capacity of the infrastructure in the country which is still good. The Indonesia Investment Coordinating Board data recorded in the third quarter 2012 that actual investment has reached Rp 229.9 trillion, up 27% compared to the same period of 2011 which amounted to Rp 181 trillion. Those achievements consist of domestic investment of Rp 65.7 trillion and Rp 164.2 trillion of foreign investment. The biggest countries which invest in Indonesia from January to September 2012 including Singapore with an investment of U.S. $3.5 billion, Japan U.S. $1.8 billion, South Korea $1.3 billion, UK $900 million and U.S. $700 million. Primus explained that the opportunity for Indonesia to encourage the inflow of foreign investment into Indonesia is still quite large, due to the economic growth of Indonesia which is the highest in ASEAN. In addition, this year Indonesia is still considered to have sufficient capital to attract investment, and has political stability, security, economy and the market are quite large, as well as, the amount of natural resources that can be used for innovation. On the other hand, the emergence of various government policies that are related to the entry of investors, makes foreign investors need to reconsider the opportunity to invest in Indonesia. The factor of legislation, government regulations and politics often lead to various constraints. Christov explains, "In line with all of it, PowerPR and Investor Daily Indonesia will organize the Indonesia Investment Forum (IIF) in Singapore, on May 15-17, 2013. The topic of this forum is discussing various investment opportunities in Indonesia, and opening a dialogue between the Indonesian Government, Indonesian enterprises as investment targets and Global Investors. 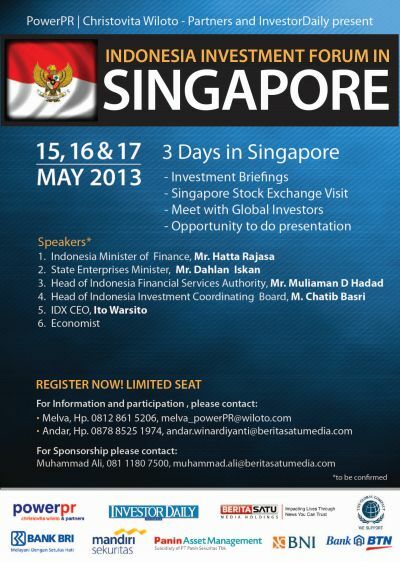 This forum will be attended by approximately 50 Indonesian enterprises and 50 Global Investors." Primus adds, "Indonesia Ministry of Finance and Indonesia Ministry of State-Owned Enterprises will be present as Keynote Speakers, along with the Indonesia Head of Investment Coordinating Board, Managing Director of the Indonesian Stock Exchange and Indonesian Head of the Commissioners Council at the Financial Services Authority. Christov said, "The main objective of Indonesia Investment Forum is to create a better understanding of the business opportunities in Indonesia, which in turn will create investment interest in Indonesia as well as to increase the number of investors who will invest in Indonesia. We invite all investors from around the world to participate in this forum."